The weather changed yesterday, and not for the better. We went from nice sunny and relatively warm days, back to what feels like the end of winter again. Cold, rain, and fresh mud. But as you know, Ollie has to go out, and today was no exception. So from 1:15 until 3:15, I set off walking around his usual favourite spots, wrapped up against the cold showers, and big boots on for the mud. On the third, or perhaps fourth, circuit of Hoe Rough, I spotted a plump male pheasant ahead of us, on the smaller side path. His vibrant plumage stood out magnificently in the gloom, and he seemed to be about some very important pheasant business, strutting purposefully along the path. Ollie spotted him too, and without a heartbeat’s hesitation, took off at speed, his approach muffled by the soggy ground. I had no fear for Mr Pheasant. They usually fly off long before Ollie gets to within three feet of them, and I suspect my dog sees it as a game that he never wins. But on this occasion, whatever was preoccupying the stout game bird had diverted his attention long enough for Ollie to suddenly be upon him. With a loud fluttering of wings, and a characteristic pheasant squawk, the bird barely escaped from between Ollie’s paws, colliding with some small branches as he took off vertically into a nearby tree. I was left lamenting the fact that we almost had pheasant for dinner tonight, and the bird lived to fight another day. So it’s back to my planned meal of chicken and chorizo paella instead. I’m sure it will be tasty enough. Mixed emotions, I’m sure. Gorgeous photo. Best to you, Pete. It’s a good one! Best to you. I feel your pain regarding the weather Pete. We had a couple of inches of snow the beginning of the week. Happy April Fools Day indeed! I have never eaten pheasant although when we were driving to Centre Parcs last Friday we saw several of them pootling about and also several chaps with shotguns all dressed up obviously on the hunt for them. I’m up for eating almost anything… I’ve just never had the opportunity. That bird is lucky, Ollie didn’t get him. Jackie caught one once, mid flight as it was taking off, very impressive jump and catch. I had to wrestle to get it off her and in the end, after plucking it, I let her have it. I also caught one when I went pheasant beating in my teens, a lucky swing of the stick. I was allowed to keep it as well as pick up my wages for the day, £15 or a brace of pheasants. Chicken and chorizo sounds much better than pheasant! But well done to Ollie for trying. Sport is always useful for health, for animals too. Ollie seems is a real hunter. Our cat – demissed 2012 – one day had a pheasant for meal. We only found some feathers in an old shed. This article was a pheasant surprise! Thanks Pete. This kindled memories. My granddad used to try and catch them. He was a hungry 30s child so an expert forager…. HA! So close to a nice fresh meal! 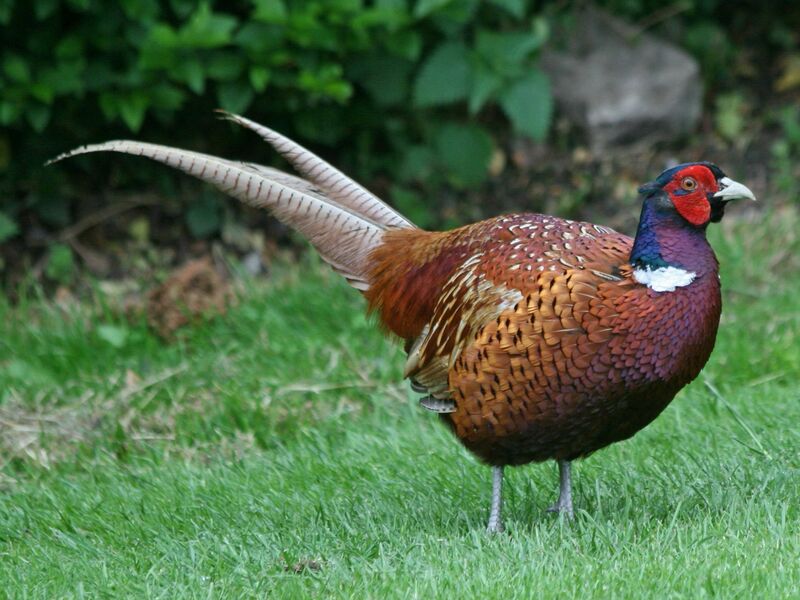 What a lovely picture of the pheasant. I don’t think our dog minds birds but he’s out patrolling the garden for foxes. They have made a big tunnel under the fence. I tried to block it with flower pots as if they can get through so can he and we have already had to fetch him back from a garden in the next street.Trouble is, as soon as I block one hole they dig another one! He has just had his summer haircut and looks very sleek – not the woolly dog in the previous photos. Once I have sorted out my new phone I’ll take another picture. I have never seen a pheasant (in the wild). I was married to an avid hunter but never had the interest. I once found a quail hiding in a box in my garage. We were both very surprised. Just about to do one, but don’t think you saw yesterdays.